Nutty, sweet and buttery, sesame seeds go well with a number of different foods, including poultry, beans, fish and grains. When you're at the grocery store, you may notice that these tiny seeds are available hulled and unhulled. 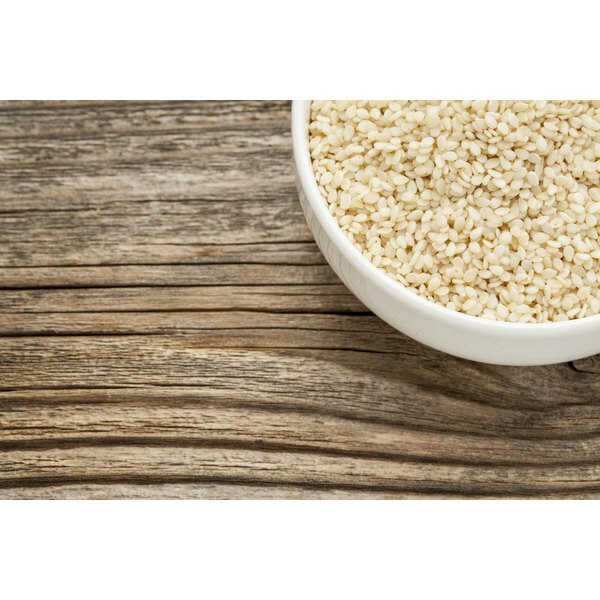 While you might not give much thought when choosing one over the other for your dishes, knowing the nutritional differences may help you decide which type of sesame seed makes a better fit for your diet. When it comes to calories, carbs, protein and fat, there isn't much difference between hulled and unhulled sesame seeds. One tablespoon of hulled seeds has 51 calories, 2 grams of carbs, 1.5 gram of protein, 4 grams of fat and 1.5 gram of fiber. The same serving of unhulled seeds has 52 calories, 2 grams of carbs, almost 2 grams of protein, 4 grams of fat and 1 gram of fiber. Sesame seeds are a calorie-dense food, which means they have a high calorie count compared to serving size. If you're counting calories, watch your portions so you don't overdo it. In a small serving size, sesame seeds may not make a huge impact on your daily vitamin intake, but there are some slight differences in the vitamin content of the hulled and unhulled seeds, most notably in vitamin A. One tablespoon of hulled sesame seeds contains 8 micrograms of dietary folate equivalent and 6 international units of vitamin A. The same serving of unhulled sesame seeds contains 9 micrograms of DFE and 1 international unit of vitamin A. Although vitamin A deficiency is rare in the U.S., according to the Office of Dietary Supplements, it is an essential nutrient that supports immune health, reproduction and vision. Both seeds also contain a small amount of some of the B vitamins, in addition to folate, including thiamin, riboflavin, niacin and vitamin B-6. One of the distinct nutritional differences between hulled and unhulled sesame seeds is their calcium and iron content. One tablespoon of hulled sesame seeds contains 0.7 milligrams of iron and 11 milligrams of calcium, while the unhulled seeds contains 1.3 milligrams of iron and 88 milligrams of calcium. Both calcium and iron are nutrients of concern, according to the Dietary Guidelines for Americans 2010, which means some people may not be getting enough of these minerals in their diet. Adequate calcium intake is necessary for bone health, and you need iron for proper cell function, making hormones and carrying oxygen throughout your body. Like the other nutrients, there are slight nutritional differences in the amount of magnesium, phosphorus, potassium and zinc in the two types of sesame seeds. One tablespoon of hulled sesame seeds contains 29 milligrams of magnesium, 66 milligrams of phosphorus, 35 milligrams of potassium and 0.9 milligrams of zinc. The same serving of unhulled sesame seeds contains 32 milligrams of magnesium, 57 milligrams of phosphorus, 42 milligrams of potassium and 0.7 milligrams of zinc.